(Nanowerk News) Extremely thin, flexible high-efficiency silicon solar cells are the solar cells of the future, according to Professor Miro Zeman. This is the gist of the inaugural address he will be giving to mark his appointment as Professor of Photovoltaic Materials and Devices at TU Delft. Zeman and his group of researchers will spend the next few years improving these silicon–based thin film solar cells. Thin film silicon solar cells (the roll-up solar cells) are cheaper and more flexible to use than the current crystalline silicon solar cells. What is more, the production process requires much less energy and fewer materials. Zeman will give his inaugural speech on Friday 11 December at 15.00. 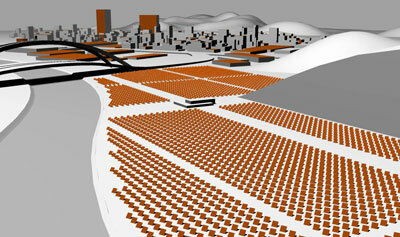 Large-scale use of thin film solar cells. Many people see solar energy as the energy source of the future. After all: the amount of solar energy reaching the earth is around 10,000 times more than the amount of energy we use. But today’s solar panels are expensive and their potential yield is limited. One way of making solar cells cheaper is to use a much thinner layer of semi-conducting material. The layer of semi-conducting material in thin film solar cells is around 1,000 times thinner than that of the regular crystalline silicon solar cells currently fitted to roofs. This not only makes them cheaper, it also makes them more flexible and easier to use. However, the energy yield is still low: output from the first thin film silicon solar cell produced in 1976 was 2.4%; the latest thin film silicon solar cells transform 10% of incident sunlight into electricity. The yield is expected to rise to around 15% in the near future. Although thin film solar cells can be made from all kinds of materials, Zeman is a firm believer in silicon: “Materials such as tellurium and indium are in short supply; silicon (processed sand) is not, which makes it a highly suitable alternative for large-scale use.” Zeman’s group is helping with the development of flexible solar cells at Helianthos, a subsidiary of Nuon. In June 2009, Nuon opened the first pilot plant in Arnhem. Zeman’s research group is concentrating its efforts on using nanotechnology to develop materials and systems for photovoltaic solar cells. Over the next few years, the group will focus on improving the efficiency of thin film silicon solar cells by applying photon management, which involves controlling the incident light particles so that a particle ejects as many electrons as possible, thereby generating the maximum amount of electric current. This may involve directing a photon through the material diagonally or reflecting the particles, and will ultimately result in a tenfold increase in the optical thickness of the cell. Professor Miro Zeman will be giving his inaugural address on Friday 11 December 2009 at 15.00 in the TU Delft Aula Congress Centre, Mekelweg 5 in Delft.